Electric guitars are noisy. While most of the noise is good, even desired, the hiss and hum caused by radio frequency interference (RFI) and electro-mechanical interference (EMI) is annoying to say the least. There are many sources of interference on stage, in the studio, and even in your home. The best way to combat this interference is to shield your guitar. 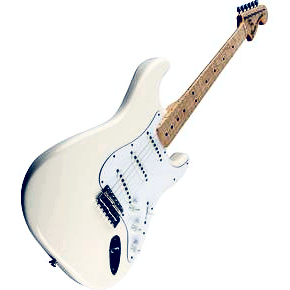 This article focuses on shielding a solid body guitar. It's fairly easy to do, but can be a bit tricky if you've never done it before. Shielding your guitar simply means creating a protective barrier around your guitar's wiring, controls, and pickups to block RFI and EMI. You do this by lining all body cavities that house pickups and controls (volume, tone, selector switch), pickguard (if it covers shielded body cavities) and control cavity covers with a metallic shield material. The two basic choices of shield material are paint-on shield and foil. I've read mixed reviews about the paint-on shield effectiveness, so I've been reluctant to try it. I prefer using self-stick copper foil because it's fairly easy to work with and provides a solid shield. Aluminum foil would also work, but you'll need to use a spray or brush-on adhesive if you can't find self-stick aluminum tape. I'll walk through the shielding process of using self-stick copper tape to shield a Strat, but the process also applies to other guitars. You'll need to shield the control and pickup body cavities, and back of the pickguard. The output jack cavity and rear tremolo spring cavity do not need to be shielded. Copper tape comes in various widths. You could use 2" or 4" widths for pickguards and control cavity covers, and 1" or ½" widths for pickup cavities and control cavities. If you want to buy only one width, I suggest 1½" or 2" wide tape. Ten feet of 1½" wide tape should be plenty to shield a Strat or Les Paul. Also, make sure the copper tape has a conductive adhesive. Otherwise, you'll need to solder the tape seams to connect the individual pieces. The 2-conductor shielded cable is used to connect the output jack to the guitar's controls. Because the cable is shielded, you don't need to shield the jack cavity. 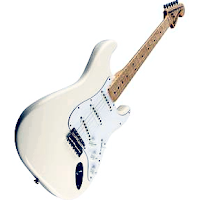 You'll need about 1 foot of cable for a Strat and guitars with pickups mounted to the pickguard, and somewhat less for guitars with pickups mounted to the body. Also, long wire runs from a pickup selector switch in a separate body cavity, such as a Les Paul, should use shielded cable. If you have a guitar like this that uses regular unshielded wire for the selector switch, consider replacing it with a shielded cable. For 3-way selectors, you'll need a 3-conductor cable—one lead for each pickup and the third for the output jack. A continuity tester is a must. Most multimeters, including the cheap ones, have this function. If you don't have a multimeter, I highly recommend getting one. You can also make a continuity tester using a battery, some wire and a flashlight bulb or an LED with a 1K resistor. Once you've gathered all the parts and tools needed, the next step is to prepare the surfaces that you're going to shield. Remove all dust and debris from the cavities and back of the pickguard or cavity covers. Clean the surfaces to be shielded using a small amount of alcohol on a lint-free cloth and wipe the surfaces with a dry cloth. Remove the output jack wire from the control cavity either by tucking it back into the access hole or by pulling it through the access hole. You'll probably need to remove the output jack from the guitar to do this. For Strat type guitars, remove the tremolo claw ground wire from the control cavity by pulling it through the access hole from the rear spring cavity. For other guitar types, remove the bridge/tailpiece ground wire from the control cavity if possible. Don't worry if you can't remove these ground wires, you can just apply the shield around them. Cut pieces of the copper foil tape to cover the back of the pickguard or cavity cover up to the edges. Remove the backing and apply the tape to the surface making sure to overlap each piece at least ⅛". The overlapping ensures electrical continuity between the pieces of foil. You can test the continuity between pieces using a multimeter or other continuity tester. If there is no continuity between pieces, try connecting them by placing another small piece of foil tape over the two pieces. Poke through all the screw holes covered by the copper foil tape, and trim any excess that may show when the pickguard or cavity cover is mounted. Now cut pieces of foil tape to cover the sides and bottom of the cavities. You'll want to extend the foil up the sides over the top surface a bit, especially around the mounting screw holes, so it will make contact with the back side of the pickguard or cavity cover (see photos). Apply the tape as described above, overlapping the individual pieces and covering all cavity surfaces. Test the continuity between the foil tape pieces as described above. It's important that all points of the foil shielding have continuity. Poke through all the screw holes and access holes covered by the copper foil tape, and trim any excess that may show when the pickguard or cavity cover is mounted. The gray cable in the control cavity is from the output jack, and has a solid foil shield (blue in photo) with a bare drain wire and 2 insulated leads (red and black in this example). You can also use a cable with a braided copper shield. The cable shield acts just like the a miniature version of the copper foil shielding. You'll need to solder the cable hot lead (red) to the output jack hot (tip) lug. Solder the cable ground lead (black) to the output jack ground (sleeve) lug. Also solder the cable shield or drain wire to the jack ground lug. Feed the other end of the jack cable into the control cavity. For standard Strat wiring, the other end of the cable's red wire is connected to the master volume control output lug. For other guitar types, connect this end of the red wire to the signal hot lead going to the output jack. The other end of the cable's black wire is connected to ground. Note that the other end of the cable shield and drain wire is NOT connected to anything. Cut the cable shield and drain wire even with the outer cable insulation on this end to prevent it from contacting anything in the control cavity. Now that the hard part is done, there's just a few bits to complete. For Strat type guitars, feed the tremolo claw ground wire back into the control cavity. Solder a ring terminal to the claw ground wire (or tailpiece ground wire). Drill a pilot hole into the side of the control cavity to mount the ground wire. If drilling the ground wire mounting hole removes some of the copper foil, place a small piece of copper foil over the hole. Now use a small ¼" to ½" long screw and flat washer to mount the ring terminal to the side of the cavity. Remount your pickups and controls (volume, tone, selector switch). Remove any separate ground wires between the controls as these cause ground loops. Make sure each control and pickup has only ONE ground connection. Remount the pickguard and tighten the mounting screws. Don't put the control knobs on yet. Test the continuity between the metal part of each control and the output jack sleeve, and the bridge/claw and the output jack sleeve. If a control or the bridge/claw is not grounded to the output jack, remove the pickguard and reinforce the copper foil around the control mounting hole or ground ring terminal mounting hole with extra layers of copper foil and test the continuity again. If you have any questions about the shielding process, please feel free to email me using the contact option on the menu.